New Custom Crop Tops for Bachelorette Parties! The sun is starting to shine, the birds are chirping, and the Spring and Summer wedding plans are underway. What’s next for soon-to-be-brides? Their bachelorette parties, of course! 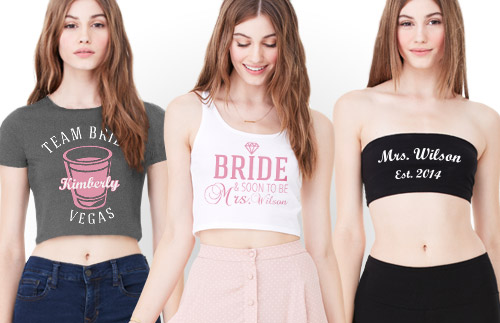 Whether you’re planning a lavish trip to Vegas, a Caribbean cruise, or a subtle staycation at the nearest hotel, Bridal Party Tees is the source for all your custom bachelorette party shirt needs! And to spice things up, we’ve add three new customizable crop tops! The Bella Crop Top Tank Top is ideal for sunny bachelorette parties! Dress it up with a maxi skirt for brunch and wear it all night during your bachelorette fun. Our Bella Crop Top Tee is just as fun and easy to style. A midi skirt and blazer turns the Crop Top Tee into the perfect daytime outfit for your bachelorette weekend. Switch it up to shorts or a skater skirt for your nighttime look! Lastly, we’ve added the Bella Bandeau Top for all the hot bachelorette parties! Customize a fun bandeau with all your girls’ names and soak up sun without the threat of awkward tan lines on your wedding day. 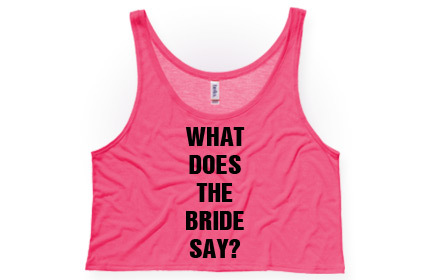 However you’re spending your Spring and Summer bachelorette parties, Bridal Party Tees has all the essentials you need. 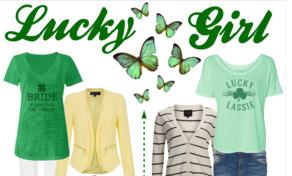 We have the trendiest apparel and offer a wide array of custom accessories. You’ve got the man, now get the custom gear! Not all brides are in love with big poofy gowns, candlelight ceremonies, or flowers cascading down the aisle. Your wedding day should be a reflection of your love: who you love and what you love. 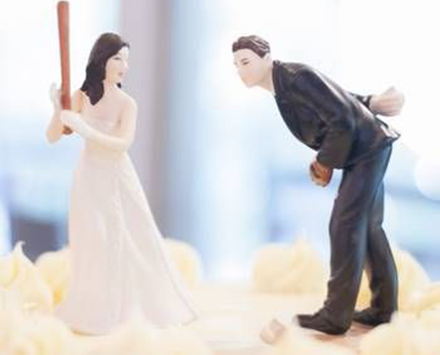 Some brides love baseball. 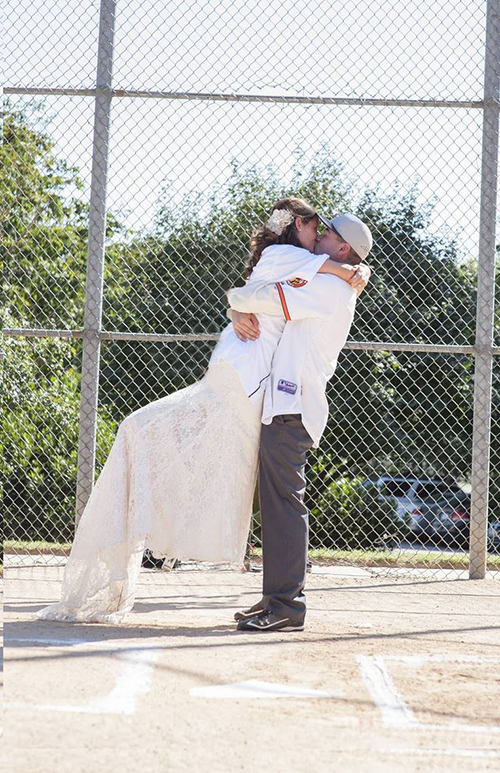 We came across bride Brandi’s Baseball themed wedding and were totally inspired! This bride didn’t fit the cookie-cutter mold, so she customized her big day to be exactly what she wanted. 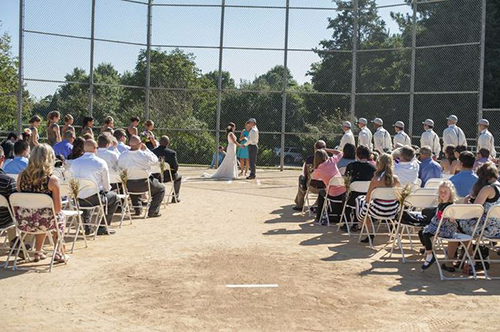 Ready to take the plate and plan your own baseball themed wedding? -Contact local parks to find a baseball diamond that you can use as your venue. 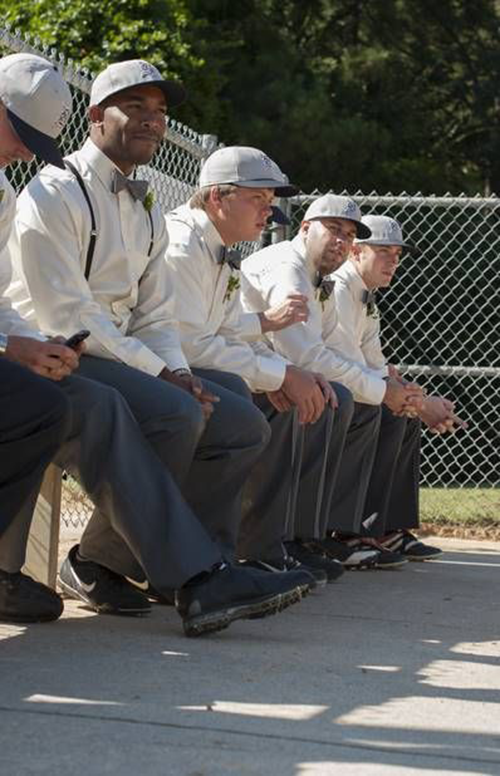 -Your groom and his men will be happy to be dressed in baseball jerseys or baseball inspired Raglan shirts and cleats. -Consider serving your guests typical game-day snacks and courses. Think peanuts and BBQ. -Hire a talented photographer to take adorable pictures with all the baseball trimmings. 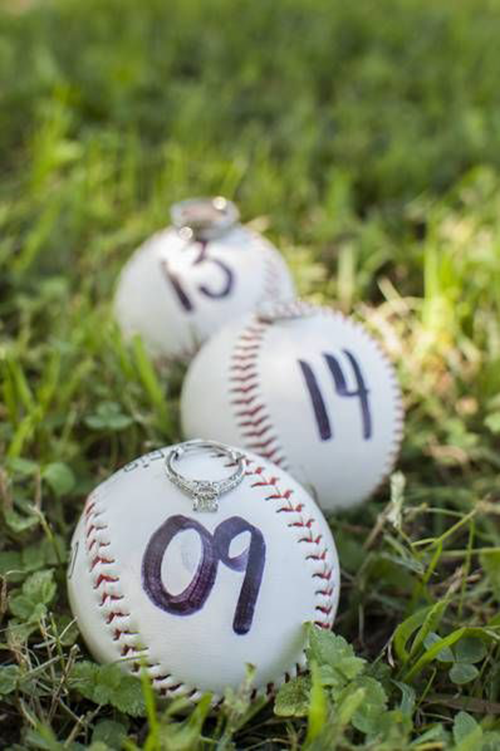 Ask them to stage shots with props like baseballs, gloves, bats, cleats, anything that inspired your unique wedding! 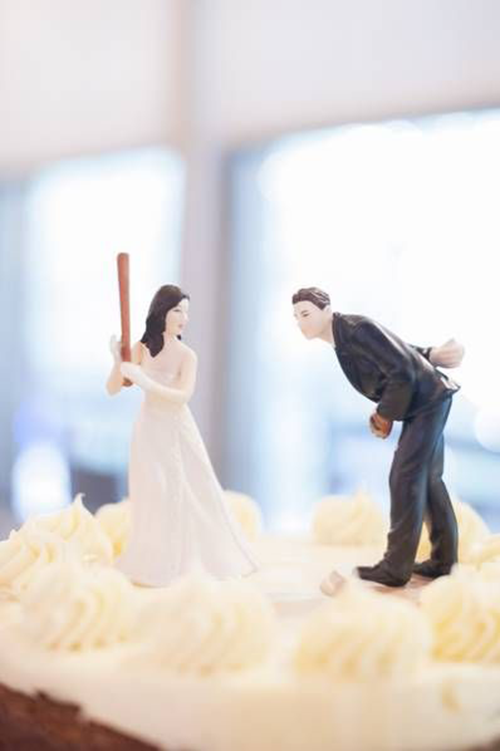 -Check out our Final At Bat designs for the brides taking their last swing. TRENDING: Orchid Weddings for Spring! 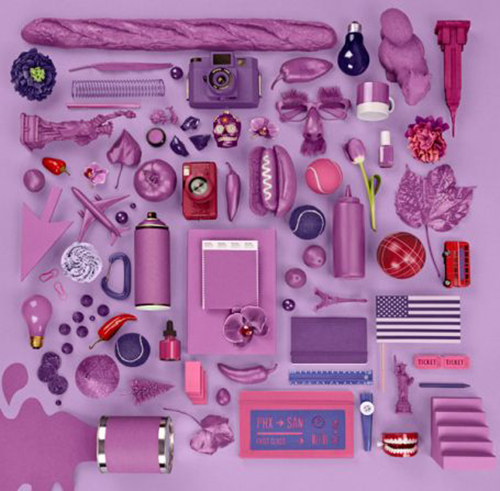 Earlier this year color experts, Pantone, announced that “radiant orchid” was the color of 2014. Since then, we’ve seen it pop up everywhere from New York Fashion Week to design blogs. And it’s no surprise that we’re starting to see the vibrant color make an appearance in everyone’s Spring wedding plans (and Pin boards)! Orchids (the flowers) have always been a go-to for wedding decor so it’s a small stretch of the imagination to picture a beautiful Spring wedding decked out in orchid orchids and various other romantic shades of the purple. Orchid embodies what Spring brides are always searching for: blossoming radiance. Set on a background of an ivory and gold church or outside amongst green trees and grass, the color pops and gives life to your venue and your ceremony. 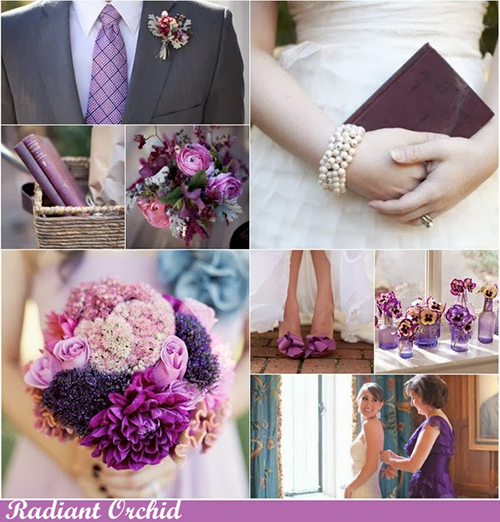 How can your wedding radiate with Orchid? Just about every way imaginable. Accent your perfect Spring bouquets of orchids with purple eyeshadows and manicures for you and your bridal party. Consider a wedding dress with a purple sash or bow. Matching heels that accent the feature will really make your look pop! Your bridesmaids will love you for picking a dress color that works with various skin tones and hair colors. Your center pieces of cascading orchids and softly lit candles will definitely add a romantic touch to your reception. There are tons of delicious ways to incorporate radiant orchid into your wedding cake design. 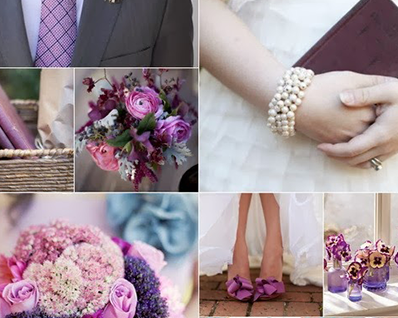 Flower appliques, purple icings, or adding purple berries perfectly combine the color of the year and the freshness of a Spring wedding. Purple desserts, aisle decor, invitations and programs, lighting and even drinks are all an easy way to add more of the decadent color to your wedding. 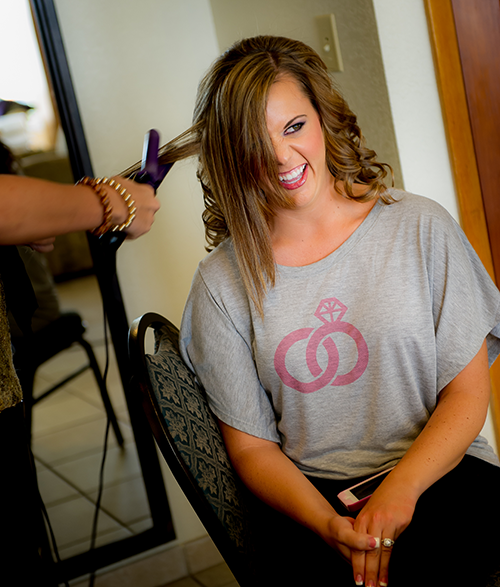 And finally, whether it’s the morning of your wedding, your bachelorette party, or just gifts for your ever helpful bridesmaids, customize some of our many bridal party shirts that we offer in the purples you love. Remember the staples of any Spring wedding is love and knowing it’s the blossoming of something wonderful! The caterer is setting up, the photographer is already snapping shots, and your groom is hidden away with his boys getting ready for your wedding. Those few hours before your ceremony starts and your girls lead you down the aisle are crucial. You’ve planned, prepped, and Pinned every detail and the show is about to start. The last thing you need is to deal with small snafus and messes… like wiping fresh eyeliner all over face when you’re getting dressed. A simple step to avoid makeup on your shirt or your hair being messed up is to get ready in an easy-off shirt. Choose something you can zip off or pull up that won’t even touch your flawless winged eyeliner or pinned up curls. Customize a before the wedding design on any of our zip-ups or loose-fitted flowy shirts like the flowy tank top or a flowy lightweight top. Have each bridesmaid assigned to a vendor. Sarah will answer any questions or deal with concerns from the caterer. Kirsten will help the photographer get all the right shots. Laura will make sure hair and makeup is on time. And so and so forth. Have a written out list of the shots that you absolutely want from the day. And make sure Kirsten has it to give to the photographer. Have checks for all of the vendors ready (including the tip) and put in separate, labeled envelopes. Round up extra extension cords from the house or home improvement store the week before the wedding. Bring them to your venue because who knows if the caterer might need one, or your curling iron or your stringed lights will reach the available outlets. Pack an emergency bag just in case. Scary truth is that any number of things can wrong at the last minute. Be prepared with a bag dedicated to extra needle and thread, an extra bottle of nail polish, bobby pins, lipstick, eyeliner, bandages, tape, flip-flops, and some pain relievers. Make a playlist! Put together a few hours long playlist with upbeat music and some oldies for you and the girls to get ready to. Give yourself enough time. 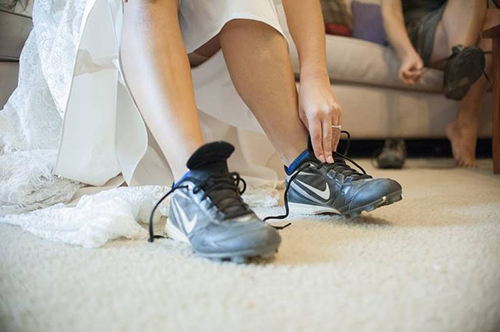 Either start your ceremony in the later afternoon or plan to get up early, just be sure to schedule yourself plenty of time to get ready. Most wedding day horrors can be cleared up before guests arrive if you just dedicate a couple of extra hours for mishaps and messes. Another cup of coffee, repurposed Mason jars, and antique jewelry. There are a number of things that get better the second time around. At the top of that list is a second wedding. Whether it’s your second marriage or the increasingly popular renewal of vows, here are several beautiful ways and helpful tips to celebrate your second wedding ceremony. If your first ceremony was held in City Hall, plan the elaborate wedding you’ve always dreamed of. If you had your first wedding in a church, but always wanted a ceremony on the beach- book your flight. Thinking an intimate evening wedding is the route to go? Sleep in, get your beauty rest, and have your romantic, candle lit ceremony. It is your wedding, and more importantly, your second chance to do and have exactly what you want. It is often the case that those planning a second marriage or vow renewal have all of the typical household items that are traditionally gifted at a first wedding. This time plan something fun for your bridal shower. Take a trip to a winery. Plan a spa day or a weekend camping trip. There are plenty of fun things to do with your close ones that will toast this special time for you without the traditional bridal shower. Customized shirts are a fun and thoughtful way to commemorate the trip or event! If you can’t think of anything you need that would warrant starting a typical registry, ask guests to donate to the charity of your choice or to your children’s college fund. Use sites like HoneyFund to create a honeymoon registry of sorts. Or add another sweet touch to your wedding by asking guests to bring you their favorite movie, book, or album- a fun and loving way to build your collection. If you’re planning a second wedding and you or your fiancé have children that you’re bringing into a new family, bring them into your new wedding. Give them big tasks so they feel incorporated and important. Flower girls, ring bearers, and ushers are useful positions that the young ones can fill and feel trusted by their new step-parent. Second time brides often think that they have to plan a family friendly honeymoon or skip it altogether. Far from true. Find someone to watch the kids if they aren’t old enough to stay home alone. Perhaps a close family member will do this in lieu of a wedding gift. Certainly don’t skip your honeymoon! 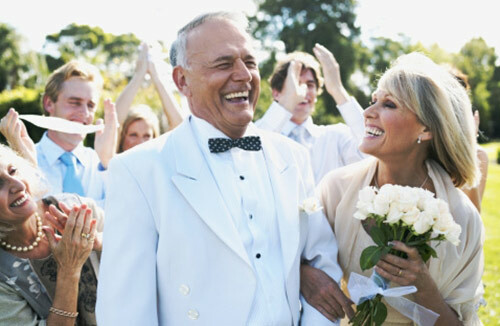 Your second wedding or vow renewal is a celebration of happiness and love in your life just as much as the first ceremony was. Plan the trip you’ve always wanted to take. Hiking the green hills of Ireland, a Mediterranean cruise, the trip to Hawaii you’ve always dreamed of- you deserve it now as much as you ever did. After all, you’re brave enough to take another chance at happiness and that’s not always easy to do. Be every bit of the brave, beautiful bride that you are. 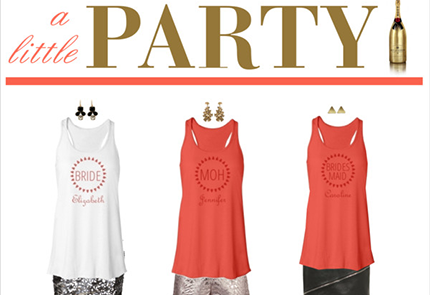 Check out our our new designs for your bridal party tees.